Clemency refers to multiple forms of presidential mercy. The two most common are commutations, which completely or partially reduce sentences for those in prison or on community supervision, and pardons, which forgive past crimes and restore civil rights. Two less-common forms are remissions, which reduce financial penalties associated with convictions, and respites, which are temporary reprieves that are usually granted to inmates for medical reasons. DOJ’s statistics, we should note, exclude clemency granted through proclamation or executive order, such as the actions taken by Gerald Ford and Jimmy Carter to forgive thousands of Vietnam-era draft dodgers. Obama was particularly active in granting clemency later in his tenure. In the 2016 fiscal year, which ended Sept. 30, he granted clemency 589 times, including 583 commutations and six pardons. That was the most of any president in any fiscal year since 1920, when Woodrow Wilson issued 341 commutations, 198 pardons, 57 respites and 43 remissions for a total of 639 acts of clemency, according to DOJ. 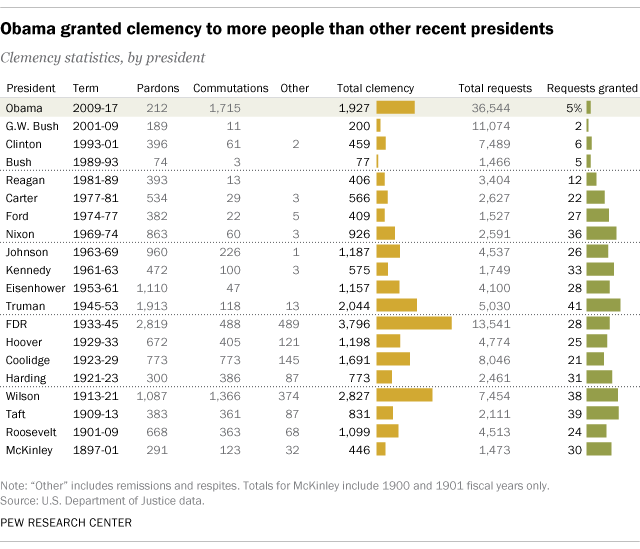 Obama’s record, however, looks far less forgiving when considering the number of requests for clemency that he received. In fiscal 2016 alone, he received 12,026 such requests, by far the most in any single year on record. Over the full course of his tenure, Obama received 36,544 petitions for clemency – a figure that exceeds the total of the previous nine presidents combined. 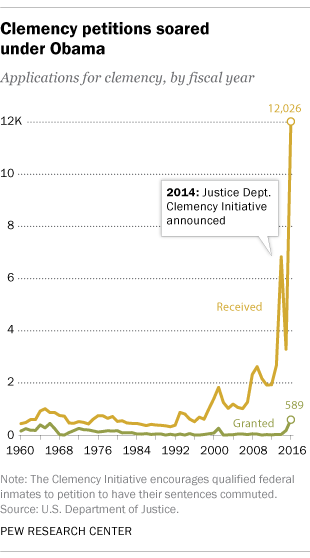 Looking at the same data another way, Obama granted clemency to only 5% of those who requested it. That’s not especially unusual among recent presidents, who have tended to use their clemency power sparingly. But it’s near the bottom when considering all chief executives since 1900, the earliest year for which DOJ has published statistics. Truman, for example, granted clemency for 41% of the petitions he received; William Howard Taft and Wilson did so for 39% and 38%, respectively. Of course, Obama received such a large number of clemency requests in part because his administration asked for them. Under a program launched in 2014 known as the Clemency Initiative, the Justice Department encouraged “qualified federal inmates” – as defined by DOJ criteria – to apply to have their prison sentences commuted. The initiative led to a surge in requests and also helps explain why Obama’s use of clemency tilted so heavily toward sentence commutations, rather than pardons. Indeed, Obama’s presidency is noteworthy for its sharp divergence between commutations and pardons. He commuted more sentences than any president on record. But he granted fewer pardons than all but two presidents for whom DOJ has statistics: George W. Bush, who issued 189, and George H.W. Bush, who issued 74 (but served only four years in office, compared with Obama’s eight). In his record use of commutations, Obama reduced sentences for federal inmates who were convicted in all 50 states, according to our analysis. Among those who received reduced penalties were 568 individuals serving life sentences and two who had been sentenced to death. Note: This is an update of a post originally published Dec. 9, 2016.